The distinctive sky blue color of the filed of the State Flag of South Dakota depicts the name and the nickname of the state, both in sunshine yellow. 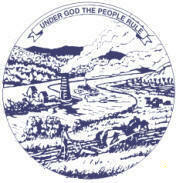 The central image reflects the images of the state seal. The South Dakota flag serves as a symbol of honor, heritage and regional pride and is displayed at state buildings. There is an Order Of Precedence for flags. State Flags are displayed in order as they entered the Union. Car Flags are often displayed to represent of an individual's allegiance to their state. South Dakota State car flags are used by their owners as mobile emblems of their home. Car flags are usually made from strong materials and are attached to a car via a pole and clip window attachment. What is the design of the South Dakota state flag? The design is a field of sky blue containing an old image of the Seal of South Dakota with the state motto "Under God the People Rule." What does the image of the seal depict? What is the history of the South Dakota State Flag? 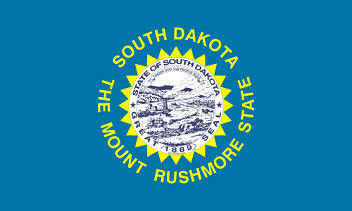 The center of the South Dakota State Flag is based on the image of the seal. 1992: "The Sunshine State" motto was conceded to Florida and legislation was enacted changing the official state motto to "The Mount Rushmore State." Flags made prior to July 1, 1992, however, remained legal until supplies were depleted. 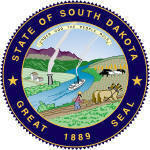 The South Dakota flag is kept and used as required by the code specified in the constitution of the state.